CLEANSE YOUR BODY & FIGHT CELLULITE! Nothing is more relaxing than a warm bath - but what if that same bath could cleanse your body and help slim you down? Relax while warm water opens your pores allowing rich dead sea salt minerals cleanse and draw out impurities. Release toxins from fat cells reducing the appearance of cellulite. Eliminate heavy metals and other harmful substances from your body. The organic Lemon Essential Oil is known to have astringent properties while the organic Tea Tree Essential Oil has endless detoxification properties especially fighting off bacteria. Get ready to FLUSH out the toxins from your body! Toxins and chemicals are all around us and if left unchecked can cause harm to your body - use this and relax, remove toxins and combat cellulite at the same time.. Try it risk free, if you are not satisfied simply let us know and we will provide you a full money back refund. 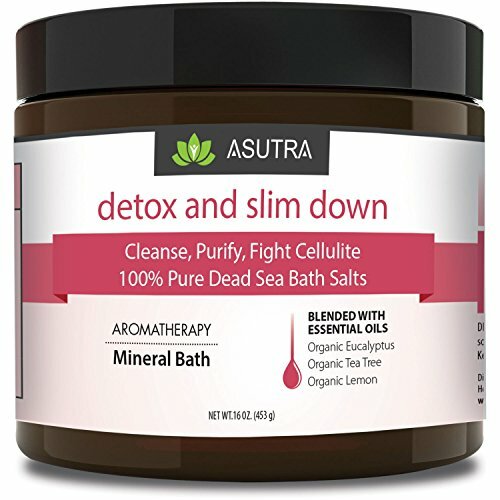 "DETOX & SLIM DOWN" bath soak is one of the easiest & enjoyable healing therapies that you can do to facilitate and enhance your body's natural detoxification process - in the privacy of your home. Taking a detox bath, not only boosts your health and well-being but it also strengthens your immune system and prevents disease. FLUID & CELLULITE REDUCING BENEFITS: Cellulite occurs when fat is trapped in compartments of tissue where there is poor circulation. "Detox & Slim Down" by ASUTRA helps with deep detoxification which can improve circulation and the suppleness of skin. Removing the impurities that are trapped in the tissues and pores helps to minimize fluid buildup. INFUSED WITH ORGANIC ESSENTIAL OILS: The blend of organic Tea Tree, Eucalyptus, and Lemon essential oils not only aids in the detoxification process but will also create a spa like aromatic sanctuary in and around your tub. Imagine relaxing in this warm dead sea salt bath with therapeutic vapors surrounding your entire body. This is not your ordinary bath soak! 100% SATISFACTION GUARANTEE We are so confident you will love "Detox & Slim Down" that we offer a FULL REFUND - NO QUESTIONS ASKED. So give it a try - our uniquely formulated dead sea bath soaks are therapeutic grade, truly healing and highly effective - guaranteed. PURE Aromatherapy Lavender and Chamomile Bubble Bath, Organic Essential Oils Bath Foam - Nourishes & Soothes, 2 Large Lavender Bubble Bath is Sulfate Free with Lavender Essential Oil!